This handmade bespoke built-in bedroom wardrobe was designed by Ian Bourne of Bourne's Fine Furniture, working closely with the client to achieve the look they were after. Inside the wardrobe there are adjustable shelves and hanging rail for flexible storage. 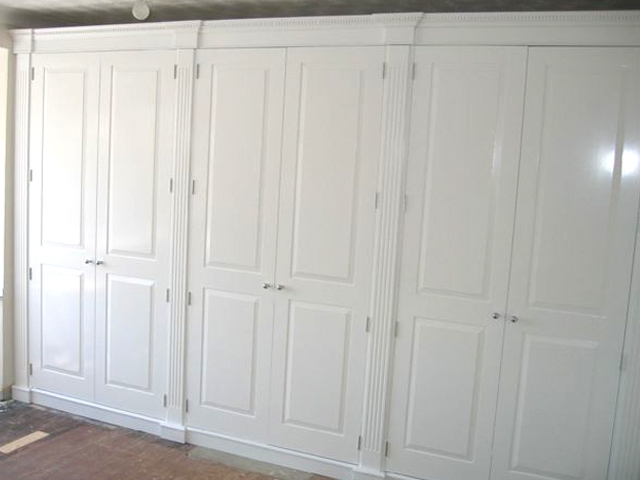 The wardrobe doors have raised panels and are completed with chrome handles and hinges. Elements of the design include the distinctive fluted pillars and dentil moulding on top of the wardrobe.